By Arnold Leese. 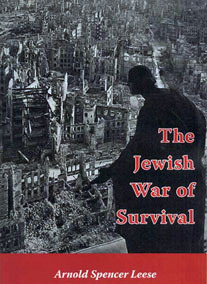 This book was written right after World War II, and offers proof that powerful Jews were the major force pushing for the war. Leese argued that behind the world unrest at that time was a Judeocentric design to build a Jewish world police state on the ruins of the ‘Gentile’ nations. The author refutes every argument given at the time on why Britain should have entered World War II. Many were the same as were later given with respect to the invasion of Iraq, e.g. : “We are meeting a challenge to our security.” This volume shows how Hitler wanted peace with Great Britain, but International Jewry wanted conflict and war, and they got their way. It quotes Jewish sources and their cronies in which they acknowledge the Jewish elite’s power, desire, and need for war in order to survive. P/B, 100pp.